Available Sept. 1: What better time to stream "Jaws" than at summer's end? You can even create a "Jaws" marathon, since "Jaws 2," "Jaws 3" and "Jaws: The Revenge" will also come to Netflix that day. Available Sept. 1: "Bill and Ted's Bogus Adventure" makes for very not-bogus viewing. Available Sept. 1: If you're in the U.S. and are a fan of "The IT Crowd," you've probably already pirated the fifth season, but now you can watch it legally. Just don't drop the internet. Leaving Sept. 1: "2 Fast 2 Furious," you are just 2 good 4 Netflix, apparently. Available Sept. 1: Tell your dad "Saving Private Ryan" will now be available to stream. It'll make his weekend. Leaving Sept. 1: Perfect your Blue Steel imitation before "Zoolander" gets disappeared by Mugatu. Available Sept. 1: Anyone who tells you "Practical Magic" is not a great movie is lying to you. Get back at them by watching it. Available Sept. 1: You'll be able to stream the Famous Original "Footloose," with Famous Original Kevin Bacon. Available Sept. 1: We're not including "Top Gun" in this list just to make a "Danger Zone" joke, we promise. Available Sept. 2: The second season of Netflix original Series "Narcos" drops, with Pablo Escobar (Wagner Moura) escaping prison and stacking up the body count. Available Sept. 2: If you're not hungry before starting "Chef's Table: France," the third installment of the "Chef's Table" series, you will be by the middle of the first episode. Available Sept. 7: "Galavant" was a fun musical comedy that was canceled by ABC in May, but Seasons 1 and 2 will have a forever-ish home for whenever you want to sing along to "My Dragon Pal and Me." Leaving Sept. 9: Underrated Disney animated movies "The Emperor's New Groove" and "Lilo & Stitch" are going back in the streaming vault for a bit. Leaving Sept. 11: The Observers have won. 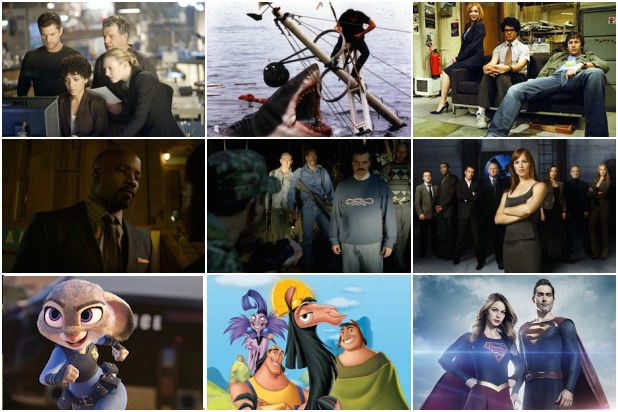 All five seasons of "Fringe" will be departing the service, leaving you with nothing but YouTube fan videos dedicated to Peter (Joshua Jackson) and Olivia (Anna Torv). Available Sept. 13: The first season of "Supergirl" hits Netflix in time for you to catch up before the second season -- which will also feature Tyler Hoechlin as the Man of Steel -- premieres on The CW on Oct. 10. Available Sept. 16: In case you're wondering, the "Ville" in "Cedric the Entertainer: Live from the Ville" is short for "Nashville," where this comedy special was shot. Available Sept. 20: Disney's smash animated hit "Zootopia" won't be on any other service or cable channel. Settle in with the kids (or by yourself) for this charmer. Available Sept. 22: The first season of Netflix original "Easy," Joe Swanberg's anthology series about the denizens of Chicago that includes Jake Johnson, Hannibal Burress, Gugu Mbatha-Raw and Aya Cash in its cast, premieres. Available Sept. 23: Documentary "Audrie & Daisy" chronicles the lives of two girls driven to suicide attempts after being sexually assaulted. Available Sept. 23: Comedian Iliza Shlesinger's third, Chicago-shot special, "Iliza Shlesinger: Confirmed Kills," hits. Available Sept. 23: Low-key modern Western (and Netflix original Series) "Longmire" returns for its fifth season of crime fighting in Wyoming. Leaving Sept. 25: September is a bad month for J.J. Abrams-produced shows on Netflix, as "Alias" and its spy family join "Fringe" in abandoning viewers who want to re-watch the incomparable "Phase Two" episode whenever they want. Leaving Sept. 25: The Ashton Kutcher "Jobs" movie didn't get quite the same acclaim as the Michael Fassbender-starring "Steve Jobs," but you'll never know what you don't like if you don't try. Available Sept. 30: Just squeaking in under the wire is "Marvel's Luke Cage," the much-anticipated third entrant in Marvel's "Defenders" series, starring Mike Colter as the indestructible hero also known as Power Man in the funny books.